The Dutch Tina Turner Tributeband! Under the name ​Hot Leggs, Hildegard Smiet is presenting herself with a Tina Turner Tribute act. Born on May 10th 1963 in Paramaribo Surinam, she moved to the Netherlands when she was 11 years old. Hildegard's live experience (almost a copy of her example and also something she doesn't like talking about too much, just like Tina), her voice and appearance on stage show big similarities with Tina Turner. After singing in several formations, she starts her first 5 members formation in the 80s, called Hot Leggs. 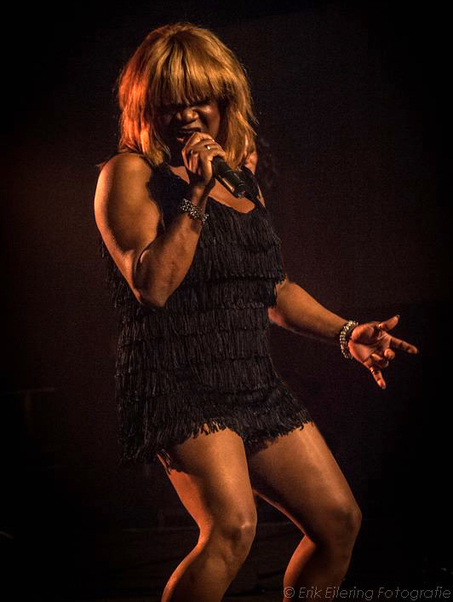 A tour with the Tina Turner Tributeband in the Dutch theaters. The Tina Turner Tribute started in the 80s when there started to be a demand for multiple Tina songs in a row, which grew out into a swirling act with her live band. In her own words, she's not a copy of Tina Turner, and she will never totally copy the movements. She is and always will be herself and her show will reveal this. ​Hot Leggs The Dutch Tina Turner Tribute grew out into a 11 members band. ​with her shows in The Netherlands and abroad.